Bats are mammals in the order Chiroptera. Their most distinguishing feature is that their forelimbs are developed as wings, making them the only mammal in the world naturally capable of flight; other mammals, such as flying squirrels and gliding phalangers, can glide for limited distances but are not capable of true sustainable flight. The word Chiroptera can be translated from the Greek words for "hand wing," as the structure of the open wing is very similar to an outspread human hand, with a membrane ( patagium) between the fingers that also stretches between hand and body. About 70 percent of bats are insectivorous. Most of the remainder feed on fruits and their juices; three bat species sustain themselves with blood and some prey on vertebrates. 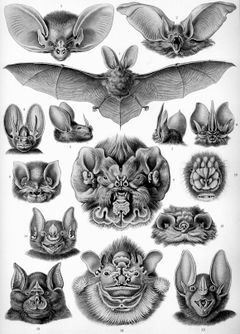 These bats include the leaf-nosed bats (Phyllostomidae) of central America and South America, and the related bulldog bats ( Noctilionidae) that feed on fish. There are at least two known species of bat that feed on other bats: the Spectral Bat or American False Vampire bat and the Ghost Bat of Australia. Some of the smaller bat species are important pollinators of some tropical flowers. Indeed, many tropical plants are now found to be totally dependent on them, not just for pollination, but for spreading their seeds by eating the resulting fruits. This role explains environmental concerns when a bat is introduced in a new setting. Tenerife provides a recent example with the introduction of the Egyptian fruit bat. Megabats eat fruit, nectar or pollen while microbats eat insects, blood (small quantities of blood of animals), small mammals, and fish, relying on echolocation for navigation and finding prey. Genetic evidence, however, indicates that some microbats ("Yinochiroptera") are more closely related to megabats than to the other microbats ("Yangochiroptera"). There is some morphological evidence that Megachiroptera evolved flight separately from Microchiroptera; if so, the Microchiroptera would have uncertain affinities. When adaptations to flight are discounted in a cladistic analysis, the Megachiroptera are allied to the primates by anatomical features that are not shared with Microchiroptera. Little is known about the evolution of bats, since their small, delicate skeletons do not fossilize well. However a late Cretaceous tooth from South America resembles that of an early Microchiropteran bat. The oldest known definite bat fossils, such as Icaronycteris, Archaeonycteris, Palaeochiropteryx and Hassianycteris, are from the early Eocene (about 50 million years ago), but they were already very similar to modern microbats. Archaeopteropus, formerly classified as the earliest known megachiropteran, is now classified as a microchiropteran. Bats are traditionally grouped with the tree shrews ( Scandentia), colugos ( Dermoptera), and the primates in superorder Archonta because of the similarities between Megachiroptera and these mammals. However, molecular studies have placed them as sister group to Ferungulata, a large grouping including carnivorans, pangolins, odd-toed ungulates, even-toed ungulates, and whales. Most microbats are active at night or at twilight. 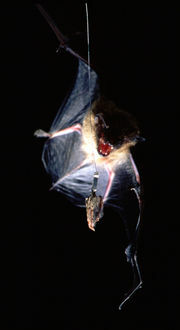 By emitting high-pitched sounds and listening to the echoes, the microbats locate prey and other nearby objects. This is the process of echolocation, a skill they share with dolphins and whales. But although the eyes of most species of microbats are small and poorly developed, the sense of vision is typically very good, especially at long distances, beyond the range of echolocation. Their senses of smell and hearing, however, are excellent. A few moths have exploited the bat's senses; in one group (the tiger moths), the moths produce ultrasonic signals to warn the bats that the moths are chemically-protected ( aposematism) (this was once thought to be a form of " radar jamming", but this theory has been disproved); in the other group ( Noctuidae) the moths have a type of hearing organ called a tympanum which responds to an incoming bat signal by causing the moth's flight muscles to twitch erratically, sending the moth into random evasive maneuvers. The teeth of microbats resemble those of the insectivorans. They are very sharp in order to bite through the hardened armour of insects or the skin of fruits. Megabats are primarily fruit- or nectar-eating. They have, however, probably evolved for some time in New Guinea without microbat concurrention. This has resulted in some smaller megabats of the genus Nyctimene becoming (partly) insectivorous to fill the vacant microbat ecological niche. Furthermore, there is some evidence that the fruit bat genus Pteralopex, which occurs in the Solomon Islands, and its close relative Mirimiri from Fiji, have evolved to fill some niches that were open because there are no nonvolant mammals in those islands. While other mammals have one-way valves only in their veins to prevent the blood from flowing backwards, bats also have the same mechanism in their arteries. The finger bones of a bat are much more flexible than those of other mammals. One reason is that the cartilage in their fingers lacks calcium and other minerals nearer the tips, increasing their ability to bend without splintering. The cross section of the finger bone is also flattened instead of circular as is the bone in a human finger, making it even more flexible. The skin on their wing membranes is a lot more elastic and can stretch much more than what is usually seen among mammals. Because their wings are much thinner than those of birds, bats can maneuver more quickly and more precisely than birds. The surface of their wings are also equipped with touch-sensitive receptors on small bumps called Merkel cells, found in most mammals, including humans. But these sensitive areas are different in bats as each bump has a tiny hair in the centre, making it even more sensitive, and allowing the bat to detect and collect information about the air flowing over its wings. An additional kind of receptor cell is found in the wing membrane of species that use their wings to catch prey. This receptor cell is sensitive to the stretching of the membrane. The cells are concentrated in areas of the membrane where insects hit the wings when the bats capture them. Mother bats usually have only one offspring per year. A baby bat is referred to as a pup. Pups are usually left in the roost when they are not nursing. However, a newborn bat can cling to the fur of the mother and be transported, although they soon grow too large for this. It would be difficult for an adult bat to carry more than one young, but normally only one young is born. Bats often form nursery roosts, with many females giving birth in the same area, be it a cave, a tree hole, or a cavity in a building. Mother bats are able to find their young in huge colonies of millions of other pups. Pups have even been seen to feed on other mothers' milk if their mother is dry. Only the mother cares for the young, and there is no continuous partnership with male bats. Studies also show that bats make all kinds of sounds to communicate with others. Scientists in the field have listened to bats and have been able to identify some sounds with some behaviour bats will make right after the sounds are made. 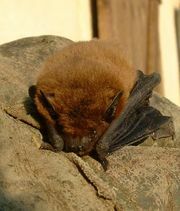 Bats are natural reservoirs or vectors for a large number of zoonotic pathogens including rabies, SARS, Henipavirus (ie. Nipah virus and Hendra virus), West Nile virus and possibly ebola virus. Their high mobility, broad distribution, social behaviour (communal roosting, fission-fusion social structure) and close evolutionary relationship to humans make bats favourable hosts and disseminators of disease. Many species also appear to have a high tolerance for harbouring pathogens and often do not develop disease while infected. The following advice is only relevant to areas with endemic rabies. 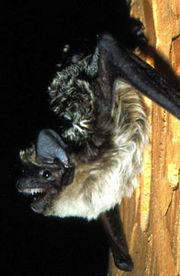 Due to the risk of rabies and also due to health problems related to their guano, bats should be excluded from inhabited parts of houses. For full detailed information on all aspects of bat management, including how to capture a bat, what to do in case of exposure, and how to bat-proof a house humanely, see the Centers for Disease Control's website on bats and rabies. In certain countries, such as the UK, it is illegal to handle bats without a license. Where rabies is not endemic, as throughout most of western Europe, small bats can be considered harmless. Larger bats can give a nasty bite. Treat them with the respect due to any wild animal. The bat is sacred in Tonga and West Africa and is often considered the physical manifestation of a separable soul. Bats are closely associated with vampires, who are said to be able to shapeshift into bats, fog or wolves. Bats are also a symbol of ghosts, death and disease. Among some Native Americans, such as the Creek, Cherokee and Apache, the bat is a trickster spirit. 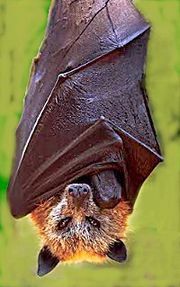 Chinese lore claims the bat is a symbol of longevity and happiness, and is similarly lucky in Poland and geographical Macedonia and among the Kwakiutl and Arabs. In Western Culture, the bat is often a symbol of the night and its foreboding nature. The bat is a primary animal associated with fictional characters of the night such as both villains like Dracula and heroes like Batman. The association of the fear of the night with the animal was treated as a literary challenge by Kenneth Oppel, who created a best selling series of novels, beginning with Silverwing, which feature bats as the central heroic figures much in a similar manner as the classic novel Watership Down did for rabbits. An old wives' tale has it that bats will entangle themselves in people's hair. A likely root to this myth is that insect-eating bats seeking prey may dive erratically toward people, who attract mosquitoes and gnats, leading the squeamish to believe that the bats are trying to get in their hair. Austin, Texas is the summer home to North America's largest urban bat colony, an estimated 1,500,000 Mexican free-tailed bats, who eat an estimated 10,000 to 30,000 pounds of insects each night and attract 100,000 tourists each year. In Sarawak, Malaysia bats are protected species under the Wildlife Protection Ordinance 1998 (see Malaysian Wildlife Law). The large Naked bat (see Mammals of Borneo) and Greater Nectar bat are consumed by the local communities. Some people enjoy bat bathing; standing at an opening to a cave they wait until the bats leave, surrounding them in a 'sea' of bats. Many people put up bat houses to attract bats just as many people put up bird houses. Reasons for this vary, but mostly centre around the fact that bats are the primary nocturnal insectivores in most if not all ecologies. Bat houses can be made from scratch, made from kits, or bought ready made. Plans for bat houses exist on many web sites, as well as guidelines for designing your own bat house. Some conservation societies are giving away free bat houses to bat enthusiasts worldwide.